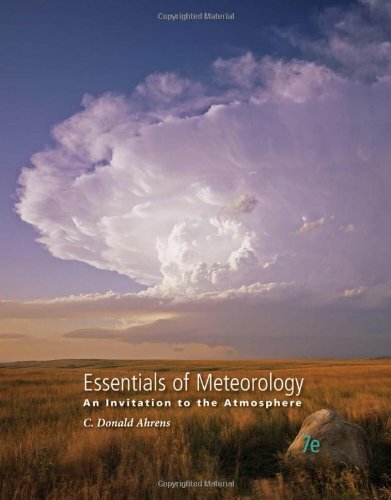 128546236X – This updated and enhanced seventh edition of ESSENTIALS OF METEOROLOGY is written by the most widely read and authoritative author in introductory meteorology-Donald Ahrens. Ahrens’s ability to explain relatively complicated ideas in a student-friendly, manageable fashion allows even non-science students to visualize the principles of meteorology. The text’s clear and inviting narrative is supplemented by numerous pedagogical features that encourage observing, calculating, and synthesizing information. New critical thinking questions linked to key figures and concept animation boxes point to online animations and appendices allowing students to immediately apply the text material to the world around them–and understand the underlying meteorological principles.